No it's not quite a cake but you still bake a biscuit right? Since entering the world of gluten free lifestyles I have found it so hard to find a nice biscuit (lets face it , nice anything!). But now I look no further. Just before Christmas I ordered a gluten free hamper from Amazon when it was on offer for £17, (does anyone else remember when Amazon just sold books?). This hamper had a variety of things from biscuits and crackers to pasta. I have had so much food I've brought to try that I completely forgot this gem was in my box in the cupboard, What I'm talking about is the Lazy day Belgian Dark Dipped Ginger Snaps. 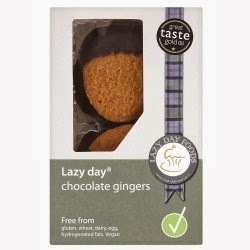 Honestly I cannot tell the difference between this and a gluten filled equivalent, the chocolate has the rich slightly bitter taste and the biscuit has a proper snap to it, with no odd powdery texture or horrible aftertaste that many gluten free confectionary has, I am over the moon I have tried these and will most definitely try more from the Lazy Day brand. There is 8 biscuits in the box and on the Lazy day website they are £2.39 or £2.45 in Waitrose, and as other gluten free shoppers know, having a gluten intolerance is not cheap! However I feel that these are very reasonably priced for the quality you are receiving, to think I have spent £4 on biscuits that taste like eating card and rice!